This morning Donald Trump set off yet another frenzy of confusion when he bizarrely claimed that House Intelligence Committee Chairman Adam Schiff was “stealing people who work at White House.” Was he accusing Schiff of kidnapping Stephen Miller while distracting Matt Whitaker with a butterfly? Not quite. 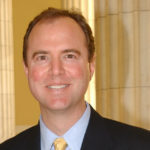 Adam Schiff is assembling a top team of legal and security talent to help with the House Intel Committee’s investigation into Donald Trump’s Russia-related crimes. To that end, Schiff has hired some people who used to work for Trump’s National Security Counsel. This is a wise move, as these people have the unique expertise required to help get to the bottom of the Trump-Russia treason. Schiff is, of course, savvy enough to figure out which of these people can be trusted, and which of them have been corruptly loyal to Donald Trump. But don’t tell that to Trump, who has decided that these are all his people, even though none of them appear to have even worked at the White House, and – by definition – all of them have either quit or been fired since Trump took office. Can you really “steal” people who have already left?